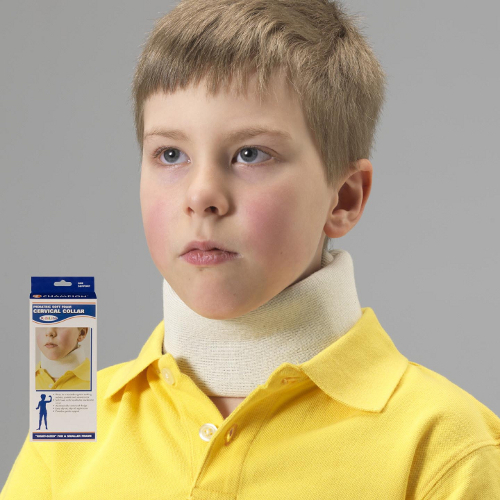 The KidsLine Soft Foam Cervical Collar is cut and assembled to follow the same anatomically correct profile as our popular adult versions, but are -right sized- to fit a smaller frame. The SAI / Champion KidsLine Soft Foam Cervical Collar is cut and assembled to follow the same anatomically correct profile as our popular adult versions, but are -right sized- to fit a smaller frame. KidsLine sizes will fit approximately 95% of children, providing an excellent fit and comfortable support. KidsLine uses high quality, soft materials and hand-crafted construction to provide optimum support, wearing comfort and durability for all-day everyday play - things kids and parents want most. Measure neck circumference to find size above.